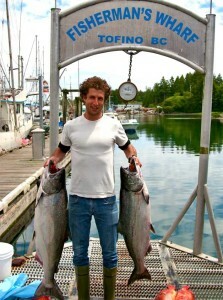 It’s not difficult to see why Tofino has earned an international reputation of being a world class fishing destination. To be successful in catching fish in Tofino, like this fellow in the picture who caught one 40lb and one 28lb salmon in one day, you don’t need to venture more than three miles from shore. How do we do it? Aside from being blessed with ample fish offshore, we have developed a technique to specifically target the big fish. We have had great success with fishing close to the bottom of the sea floor, where the big salmon tend to feed on needlefish and other baitfish. Our state of the art salmon fishing boat is fully equipped, allowing us to target and catch large salmon. Chinook salmon fishing has been even better this year than last year. We have been thrilled to see the large springs making a comeback. Even better, the fact that they showed up in early July provides a very promising outlook for the rest of the fishing season. Recent Tofino halibut catches have been falling between the 20lb to 50lb range, not more than 3 to 5 miles from Long Beach in Tofino. Reaching your fishing limit does not require a venture far from the harbour. With the large tides finished for the season, it has become much easier to keep fishing lines on the seafloor. 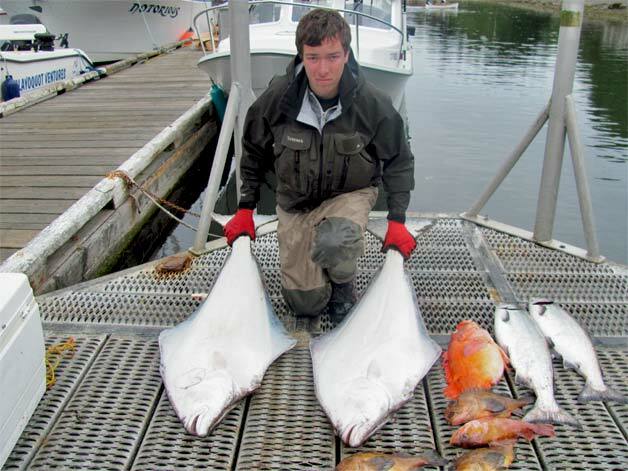 How do we entice halibut? We have been very successful in recommending that our clients take one one oversize herring and securely hook it onto one oversize grub. Hook this up to a spreader bar with a 16oz to 20oz lead ball, depending on the tide. Test this contraption in the water to ensure that a nice roll is taking place. Halibut find this irresistible. 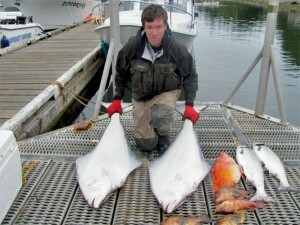 Experience the thrill of salmon and halibut fishing in world famous Tofino, British Columbia.